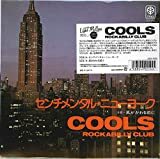 I mentioned the album “NEW YORK CITY, N.Y.” by Cools Rockabilly Club last time. There was, actually, a single which was released in October, 1977, the year before the album was released. The song on the A side was “Sentimental New York”, and on the B side, that was “Kaze ga Kawaru Mae ni”. I had been wrongly assuming that these two songs were contained in “NEW YORK CITY, N.Y.” but actually they weren’t. I guess I put them in the same cassette tape to enjoy at that time. This time, I listened to “Sentimental New York” again properly, and I was excited because it was really arranged like Yamashita Tatsuro so much that it even made me smile. It starts with the chorus that sounds comfortably deep, after that, the soft sound of the acoustic guitar came and the silence in a moment, then the vocal came to take you to the world of AOR. The sophisticated way of using chorus part and the brass section was really typical of Yamashita Tatsuro so it sounds extremely cool. In “Kaze ga Kawaru Mae ni”, on the B side, James Fujiki’s skill of writing songs shines. I was surprised when I know Yamakawa Keisuke wrote the words. He is a big name who wrote so many pop music with the atmosphere of the Showa era, and also many anime songs like “Ginga Tetsudo 999”, plus, even some children’s songs like “Kitakaze Kozo no Kantaro” and so on. I’ve never seen Cools taken up in magazines or TV music show properly. They were originally motorcycle freaks, and were also ardent fans to the band “CAROL” which was led by Yazawa Eikichi, so they have been regarded as a heretic. I’m a little bit sorry for them, because they play genuine, good music actually.